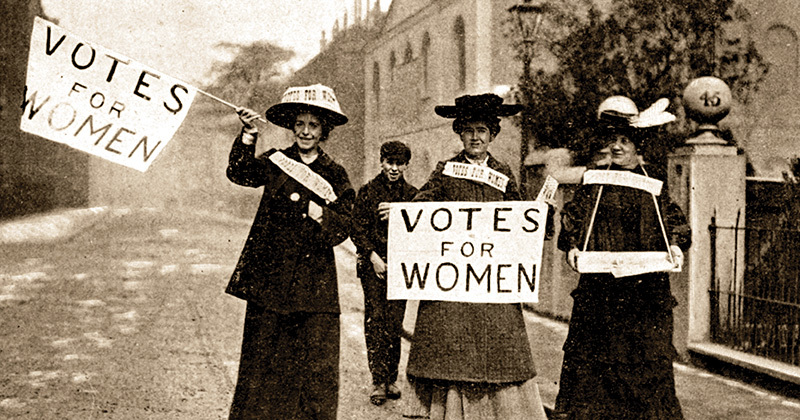 February 6th 1918, the House of Commons passed The Representation of the People Act, giving women the right to vote in the UK and satisfying almost a hundred years of struggle of the suffragettes. This scene has changed women’s position domestically and globally. To be able to tell their story, however, I needed to dig deeper and not just see the surface of the scene and the obvious actors, the British suffragettes. Meanwhile, I will be trying to answer a question: why is this scene important to look at and be analysed today? The Act celebrated its 100-year anniversary in 2018, honouring all the suffragettes who took their part in the struggle i.e. giving women political participation. The British political parties eventually joint the cause of the suffragettes, becoming essential actors by passing this ground-breaking legislation. As it has become more and more visible that the war would be won and be over soon, politicians needed to focus on the domestic terrain. But what did the Act include? The 1918 Act did not give universal suffrage to women. Only 8.5 million women met the criteria, which was to own a property and be over the age of 30, still leaving one-third of British women not qualified for political participation (Parliament, 2018). However, both political participations were given to women who met the criteria, meaning they were finally able to vote at elections and to be able to run for office. The exact same Act gave every 21-year-old man the right to vote, abolishing property and other restrictions (Ibid). Universal suffrage for women in the UK came only a decade later with the 1928 Equal Franchise Act, giving the same voting rights to women as men (The Economist, 2018). Subsequently, one would think that this scene and the bill itself is over-celebrated, as it clearly does not lead men and women to be treated as equals (Goddard and Cox, 2018). However, there is significantly more in the scene than the surface shows, and the 1918 Act is indeed important. 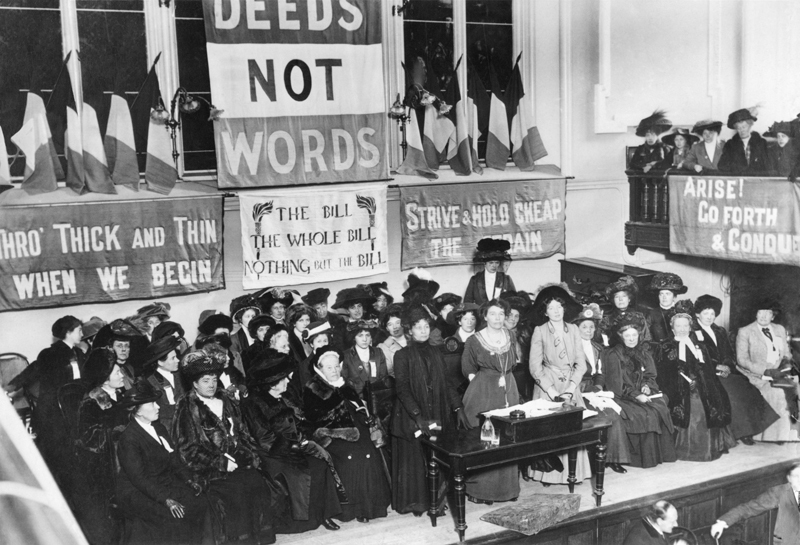 Both the Liberal National Union (LNU), led by Millicent Garett Fawcett, and Emmeline Pankhurst led Women’s Social and Political Union (WSPU) suspended their ancestors’ decades long struggle as World War I broke out, putting the country’s union before their cause (Teele, 2014). The movement’s actions have greatly contributed to the passing of the Act, before and even after the suspension. So, what were the reasons behind their actions and what did those women actually represent? The struggle developed as the French Revolution granted political participation to men in the late 18thcentury, leaving women out of the political scope, making early democracies male dominated (Ibid:538). Even in the eyes of influential thinkers, like Rousseau, women’s rights were not something anybody should consider political, as a woman’s place is at home. Rousseau’s thoughts on women were critiqued by Mary Wollstonecraft, stating that public and private spheres are both governed by the same principles and a woman is no less than a man, i.e. we are all human beings we deserve the same rights (Gatens, 1986:10). Wollstonecraft claimed her ideas through a human rights approach, being one of the first feminists. However, the norm remained and did not change for a long time, perpetuating the belief that women were just like domestic servants, or children who had no interest of their own (Teele, 2014:541), consequently, citizenship and the rights attached to it became gendered (Ramirez, Soysal and Shanahan, 1997:735). As the 19thcentury progressed, a change within family and work structures was observed and women had started to become more independent, demanding change within the public realm and politics (Teele, 2014:541). In fact, more and more countries started to give their women the right to political participation, starting with New Zealand in 1893 (Ramirez, Soysal and Shanahan, 1997:743). Thus, the British suffragettes did not only represent themselves as individuals, they were part of a larger decades long struggle, which they needed to fulfil and fight. Indeed, Pankhurst or Fawcett were not great names because they fought the hardest and were the most influential actors, they were figures who represented women from the past movements, and a cause, to make politics gender neutral. Furthermore, this did not only give those actors a cause to represent but also a reason and justification to act the way they did. However, there was a difference between the two suffragette groups, the LNU and the WSPU on what they considered justified and reasonable. For instance, the Pankhurst led WSPU, included the militia suffragettes, often using violence to achieve their goals (The Economist, 2018). As many of those women were arrested due that violence, they even continued their protest in the prison cell through hunger strikes. One of the cases was Marion Wallace Dunlop’s who had started this way of resistance, and was eventually released from prison, giving the WSPU another very influential strategy (Purvis, 2009). Dunlop’s actions were powerful not because as an individual she refused to eat, but she refused to eat representing a movement, thus, creating media attention around women’s rights. In contrast, the LNU and Fawcett herself believed in less radical ways of achieving political participation for women. The LNU’s tactics included, lobbying, propaganda, protests and cooperation with political parties (The Economist, 2018). Indeed, the LNU forged an alliance with the expanding Labour Party, by trading economic resources in exchange for the party’s active pushing for suffrage reform in the House of Commons as the Liberal’s led government was sceptical about giving the women the vote (Teele, 2014). As Teele argued in her piece, it was a very important move by the LNU and eventually led to women’s suffrage, making the Labour party an important actor in the struggle as well (2014). Furthermore, it is also important to remember the fact that the LNU and the WSPU were not enemies. They had strong ties and many women were part of both groups (The Economist, 2018). Consequently, they combined their resources i.e. violence actions and soft power tools, in order to achieve their goals and fulfil their intentions. Those women’s intentions are clear, fighting for women’s political participation. As Pankhurst puts in in her biography: “They (men) have decided that it is entirely right and proper for men to fight for their liberties and their rights, but that it is not right and proper for women to fight for theirs” (Pankhurst in Haynes, 2018). Those intentions had effects and consequences regarding the future, where those women’s fight seemed to pay off. During the late 19thand early 20thcentury a struggle regarding women’s rights was observed all around the “West” in semi-democratic countries where political participation was tied to certain criteria (Ramirez, Soysal and Shanahan, 1997). Furthermore, as the women’s suffrage movements, in all those countries, had started to be more vocal and powerful, the concept of citizenship extended through social movements of the suffragettes (Ibid). Indeed, those suffragette movements in the “West” seemed to be so successful that by the end of World War II, the newly established states and democracies gave political participation to everyone (Ibid) and women’s political participation had become a norm i.e. hegemonic (Schlossman, 2002:40). all around the world, clearly showing that all actors involved in the Act performed international politics. As my last thought on the heroic movement of the suffragettes, I want to answer the question I proposed at the beginning of this essay. We are living in a world today where women’s have equal rights as men, almost everywhere, although are not treated equally within the public sphere. One can observe lots of similarities within the suffragette movements and the MeToo movement today, fighting for women’s rights and changing people’s mind-sets on women (Haynes, 2018). I think it is important to remember that the suffragette movement was successful, and it took time, and women today have to remember not to lose faith even during hard times. Gatens, Moira (1986) “Rousseau and Wollstonecraft: Nature vs. Reason”, Australasian Journal of Philosophy, 64: 1-15. Goddard, Emily and Cox, Josie (2018) “Women’s suffrage: After 100 years since millions of women got the vote around the world how do their rights compared now?”, The Independent, 6 February, accessed at https://www.independent.co.uk/news/long_reads/women-suffrage-100-years-get-vote-right-uk-britain-ireland-us-world-countries-compare-switzerland-a8191506.html, 21 Feb. 2019. Haynes, Suyin (2018) “What 100 Years of British Women’s Suffrage Says About Women’s Rights Today”, Time, 6 February, accessed at http://time.com/5134820/british-suffragettes-centenary-women-rights-inequality/, 21 Feb. 2019. Parliament (2019) “Women get the vote” Parliament, accessed at https://www.parliament.uk/about/living-heritage/transformingsociety/electionsvoting/womenvote/overview/thevote/, 21 Feb. 2019. Purvis, June (2009) “Suffragette hunger strikes, 100 years on”, The Guardian, 6 July, accessed at https://www.theguardian.com/commentisfree/libertycentral/2009/jul/06/suffragette-hunger-strike-protest, 21 Feb. 2019. Ramirez, Francisco O. and Soysal, Yasemin and Shanahan, Suzanne (1997) “The Changing Logic of Political Citizenship: Cross-National Acquisition of Women’s Suffrage Rights, 1890 To 1990”, American Sociological Review, 62: 735-745. Sclossman, David A. (2002) Actors and Activists: Politics, Performance, and Exchange Among Social World (London: Routledge). Teele, Dawn Langan (2014) “Ordinary Democratization: The Electoral Strategy That Won British Women the Vote”, Politics and Society, 42(4): 537-561. The Economist (2018) “Britain marks a century of votes for women” The Economist, 3 February, accessed at https://www.economist.com/britain/2018/02/03/britain-marks-a-century-of-votes-for-women, 21 Feb. 2019. The Economist (2018) “What modern campaigners can learn from the fight for women’s suffrage”, The Economist, 19April, accessed at https://www.economist.com/books-and-arts/2018/04/19/what-modern-campaigners-can-learn-from-the-fight-for-womens-suffrage, 21 Feb. 2019.